We offer numerous case styles and electrical configurations, giving us one of the most comprehensive LED driver offerings in the lighting industry. Constant Current LED Drivers are available in a variety of industry-standard form factors and are engineered with wide forward voltage ranges to accommodate most popular LED loads. Many constant current drivers are available in both 0-10V and phase dimming options. Constant Voltage LED Drivers are available in a variety of industry standard form factors and are designed to meet stringent specifications for efficiency and quality. Most popular models are available in both 12V and 24V output. LED Emergency drivers allow an LED fixture to be used for normal and emergency operation when used in conjunction with a switched or un-switched AC LED Driver. In the event of a power failure, the LED Emergency driver switches to emergency mode and operates the fixture for a minimum of 90 minutes. LED Step Down Transformers have been designed to solve a common field installation issue where the line voltage does not match the desired input current for the selected LED drivers. 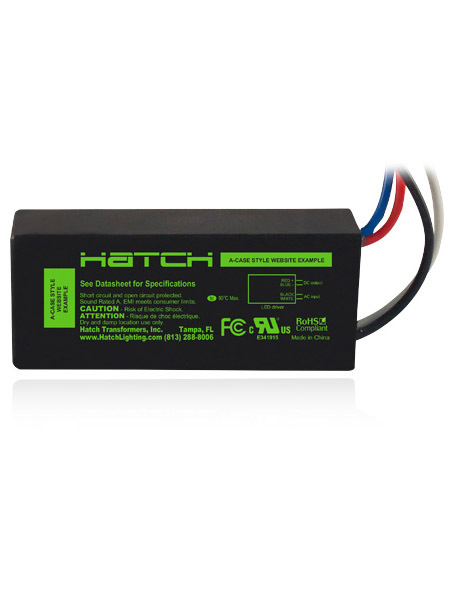 Using Hatch LED Step Down Transformers, you can efficiently convert 347V or 277V line voltage to 120V. I-LOC is an innovative family of programmable LED drivers from Hatch that require no computer programming or special installation expertise. I-LOC Technology enables quick and easy setting of the driver output current with a simple click of a key. Select the appropriate I-LOC key for the desired output current and click it into the driver.